Real World Skills? These Kids are learning them. Kids of today! What’s wrong with them? They wear their pants so low that you can see their underwear! All they do is play video games, listen to music on those darn MP3 players, or they’re texting on a cell phone. None of them could change the oil on their parent’s car let only build one. Sound familiar? Well, don’t tell that to the students involved in Formula High School. Formula High School is the idea of Mike Besel and Jeremie Meyer, high school Technology & Engineering instructors from Wisconsin. These two instructors wanted to develop a program where teams of students would build a replica race vehicle in 8 months and then test it at the track. The students choose a brand new Formula First racer, built by Sugar Grove Custom Cars as their model. A Formula First racecar is a single seat, open wheel style racecar, utilizing a VW engine, transmission and front beam suspension. Jim Woodsmall, owner of SGCC, was gracious enough to help out this new program. The actual molds used to build the body panels for his Mysterian M5 were brought to Green Bay, WI. Here, under the direction of a local fiberglass company, the teams of students learned how to lay up a fiberglass body. Yep, those same students who might look like they badly need a set of suspenders rolled up their shirtsleeves and learned how to lay in fiberglass mat and resin. Once the bodies were removed from the molds, the students were responsible for trimming and fitting the panels to the chassis. The chassis for these vehicles are also based on the original. Students received a 3D computer model of the main cockpit section of the chassis. This ensured proper placement of roll bars and bracing so the vehicles were safe. The students then used computer-modeling software to design the rest of their chassis. Students had to incorporate engineering and manufacturing techniques learned in class to construct their vehicles. Now that’s a real world test! To closely match the original racecar, the students were also required to use VW spindles and brakes. This allowed the students to also include a steel wheel and tire assembly that mimicked the road racing tires used on the Formula First vehicles. To keep costs down, the students were limited to a 16 HP Briggs & Stratton v-twin engine. The same engine used on your typical lawn tractor. Transmissions were kept simple: a chain driven centrifugal clutch on the engine to a solid axle rear. With this drive-train set-up, the typical speeds reached were kept under 50 MPH on the track. Now I know some people are thinking, “Tax money is paying for this?” Actually, all teams have to locate their own sponsors. By using off-the-shelf parts and a lot of elbow grease, the students are able to construct a complete car for $3000. The students also learned how to present to prospective sponsors and how to create brochures and write-ups promoting their team. Yep, the students had to use those same concepts taught in English and Speech class. 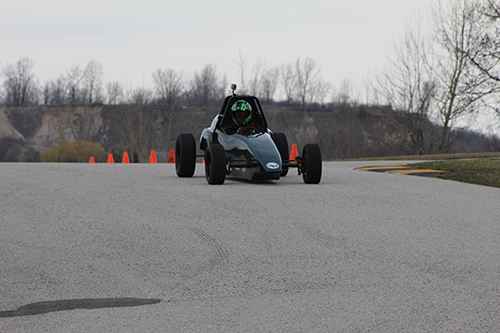 The last test for the students was the first annual Formula High School track day, held on April 27, 2009 at the Blain's Farm and Fleet Motorplex. The Motorplex is located on the grounds of Road America in Elkhart Lake, WI. If you haven’t heard of Road America, it’s the nations largest road track in the US. It’s a world-class facility. 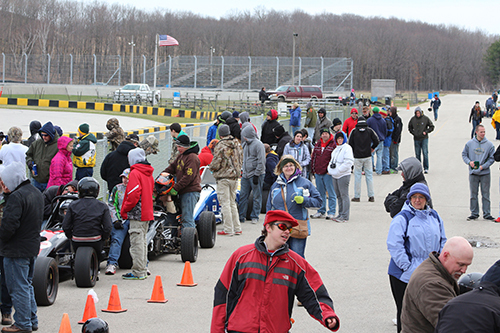 The students were allowed on the Motorplex track, one at time, to see who could set the lowest lap time. Teams were required to have at least three different drivers. The average of the lowest times of three different drivers was used to calculate the “winner”. What did they win: the bragging rights for that year. The teams also had to repair any issues at the track on their own. No more teacher help. Time to stand on their own two feet. Overall the program was a great success. More schools are interested in getting involved for next year. Now…why didn’t they have something like this when I was in school?